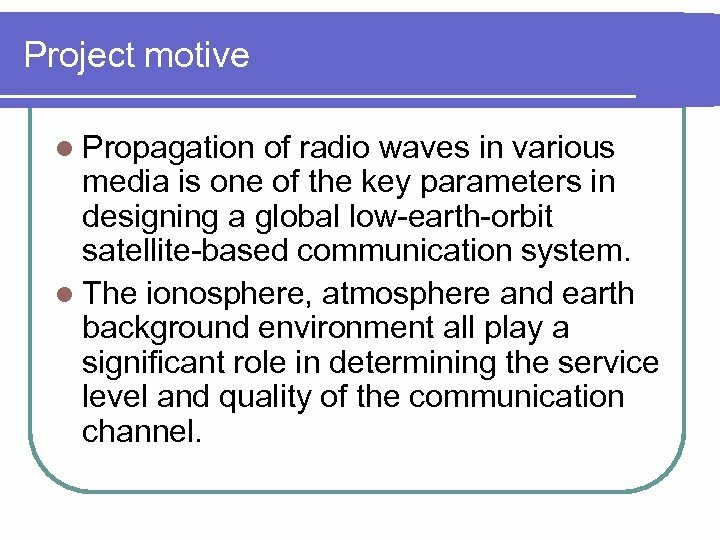 Project motive l Propagation of radio waves in various media is one of the key parameters in designing a global low-earth-orbit satellite-based communication system. 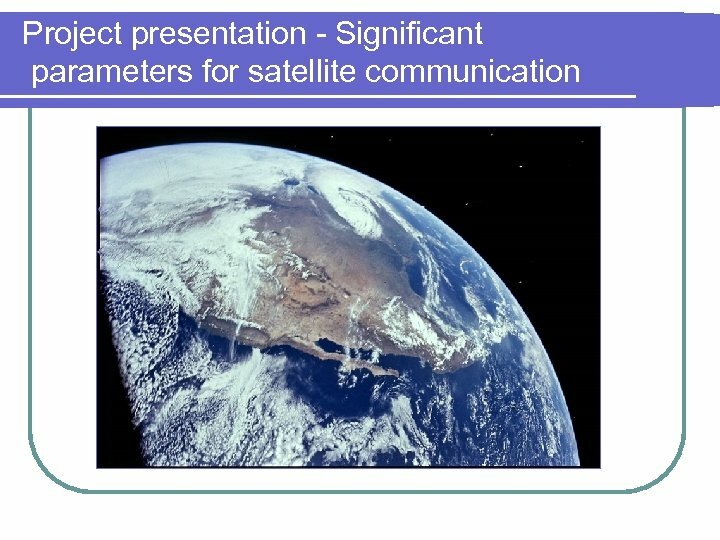 l The ionosphere, atmosphere and earth background environment all play a significant role in determining the service level and quality of the communication channel. 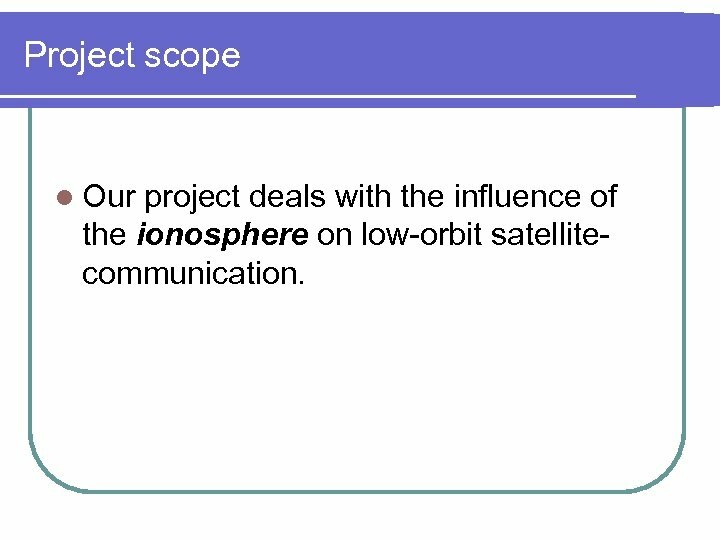 Project scope l Our project deals with the influence of the ionosphere on low-orbit satellitecommunication. 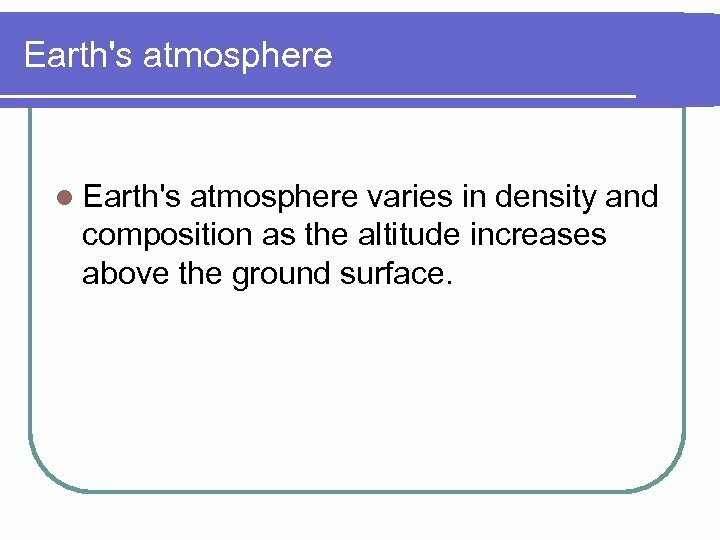 Earth's atmosphere l Earth's atmosphere varies in density and composition as the altitude increases above the ground surface. 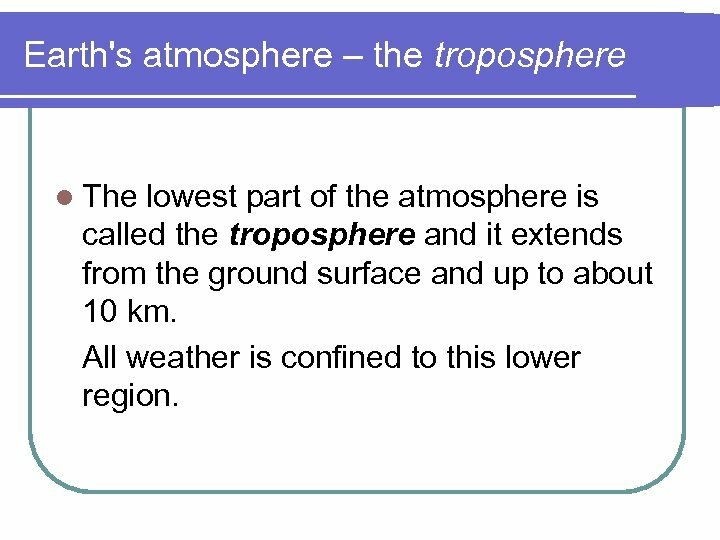 Earth's atmosphere – the troposphere l The lowest part of the atmosphere is called the troposphere and it extends from the ground surface and up to about 10 km. All weather is confined to this lower region. 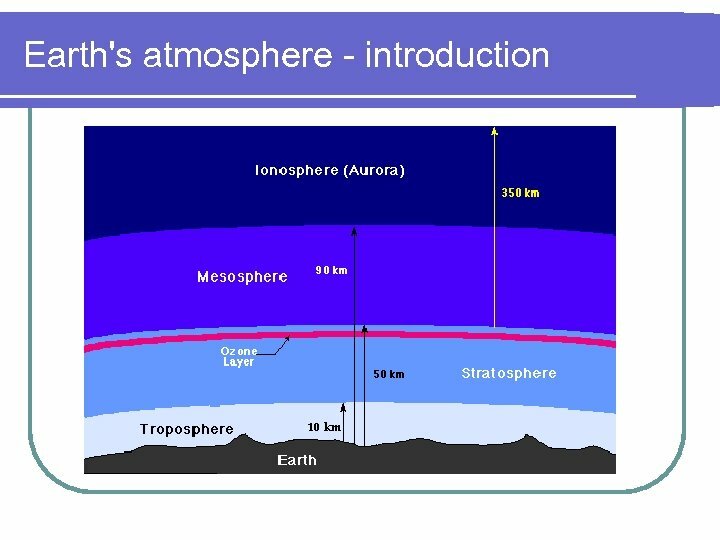 Earth's atmosphere – the stratosphere l The atmosphere above 10 km is called the stratosphere. 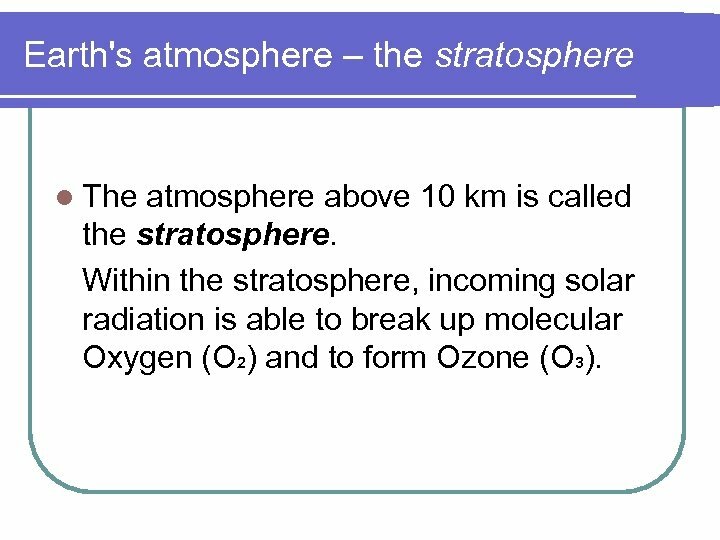 Within the stratosphere, incoming solar radiation is able to break up molecular Oxygen (O 2) and to form Ozone (O 3). 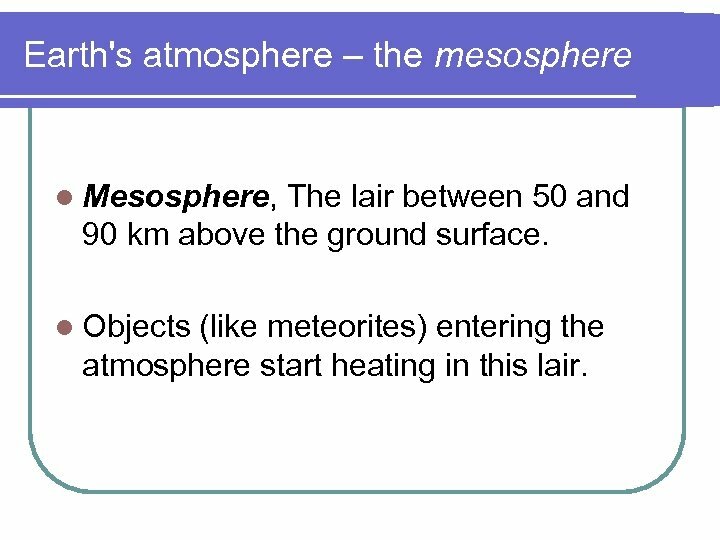 Earth's atmosphere – the mesosphere l Mesosphere, The lair between 50 and 90 km above the ground surface. l Objects (like meteorites) entering the atmosphere start heating in this lair. 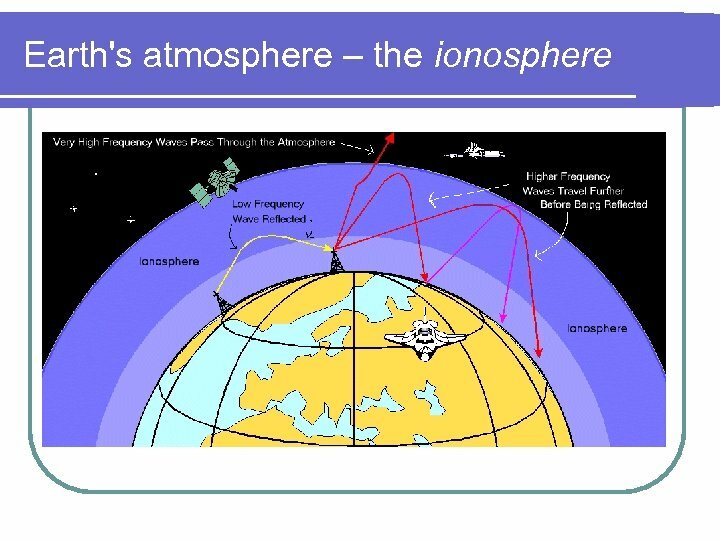 Earth's atmosphere – the ionosphere l At heights of 90 km and above, the existence of charged particles signals the beginning of the ionosphere region. 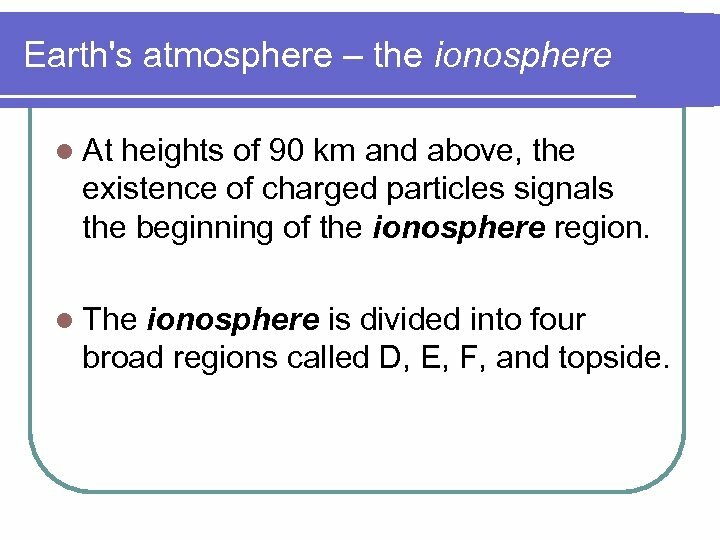 l The ionosphere is divided into four broad regions called D, E, F, and topside. 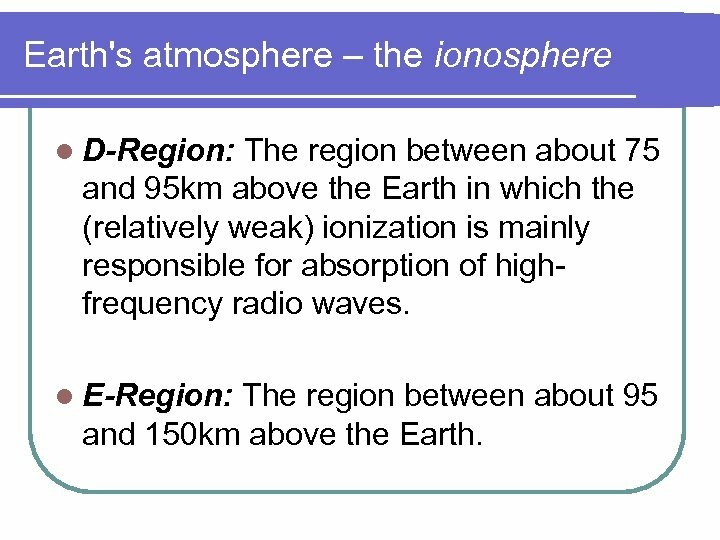 Earth's atmosphere – the ionosphere l D-Region: The region between about 75 and 95 km above the Earth in which the (relatively weak) ionization is mainly responsible for absorption of highfrequency radio waves. l E-Region: The region between about 95 and 150 km above the Earth. 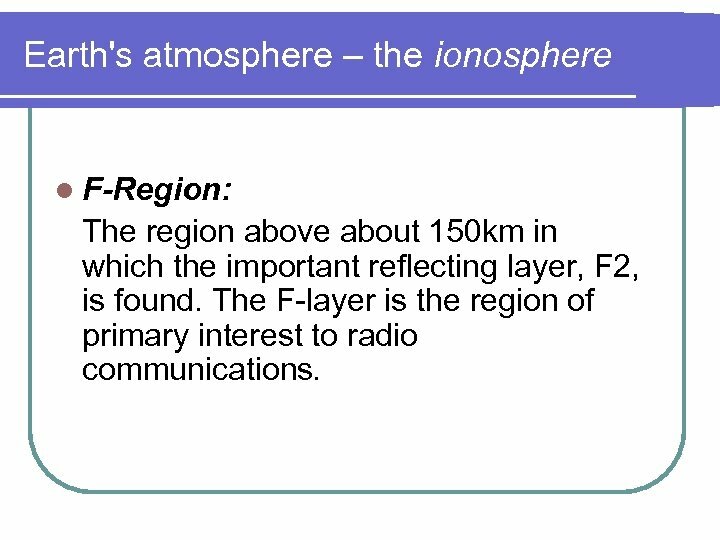 Earth's atmosphere – the ionosphere l F-Region: The region above about 150 km in which the important reflecting layer, F 2, is found. The F-layer is the region of primary interest to radio communications. 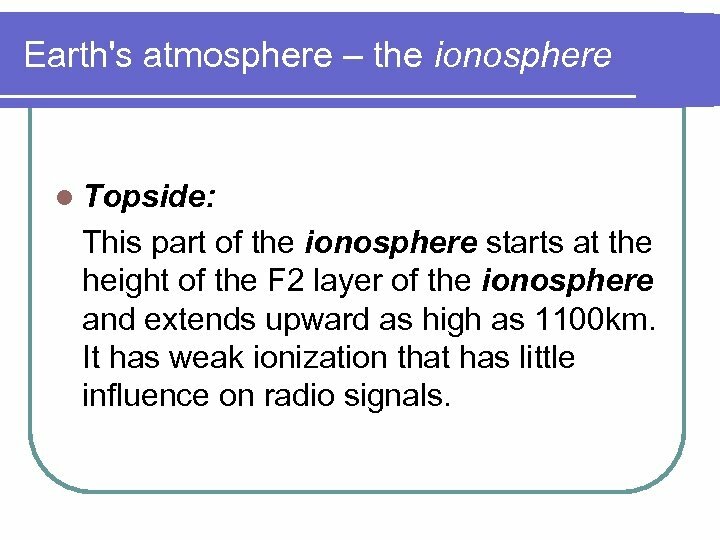 Earth's atmosphere – the ionosphere l Topside: This part of the ionosphere starts at the height of the F 2 layer of the ionosphere and extends upward as high as 1100 km. It has weak ionization that has little influence on radio signals. 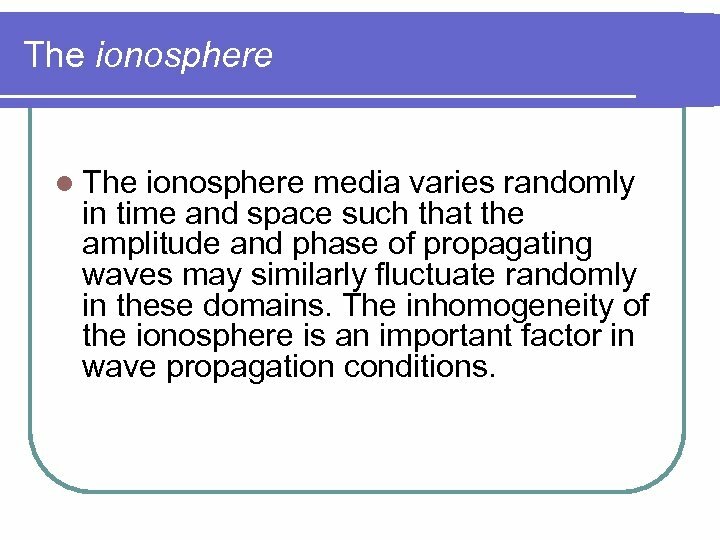 The ionosphere l The ionosphere media varies randomly in time and space such that the amplitude and phase of propagating waves may similarly fluctuate randomly in these domains. 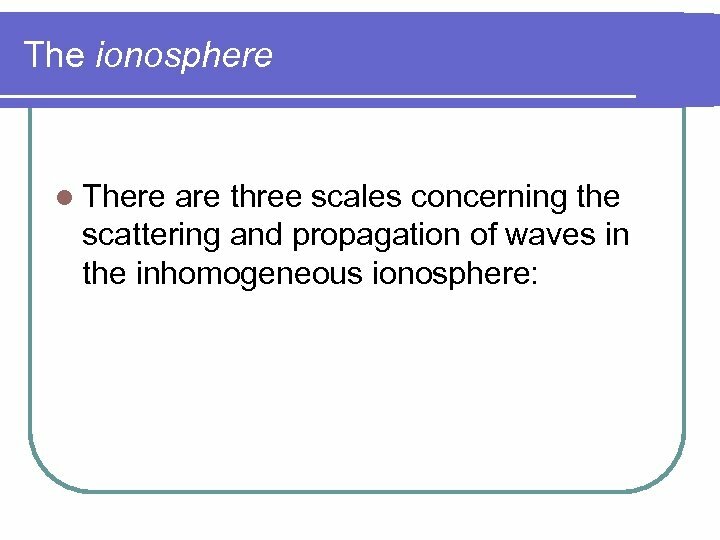 The inhomogeneity of the ionosphere is an important factor in wave propagation conditions. 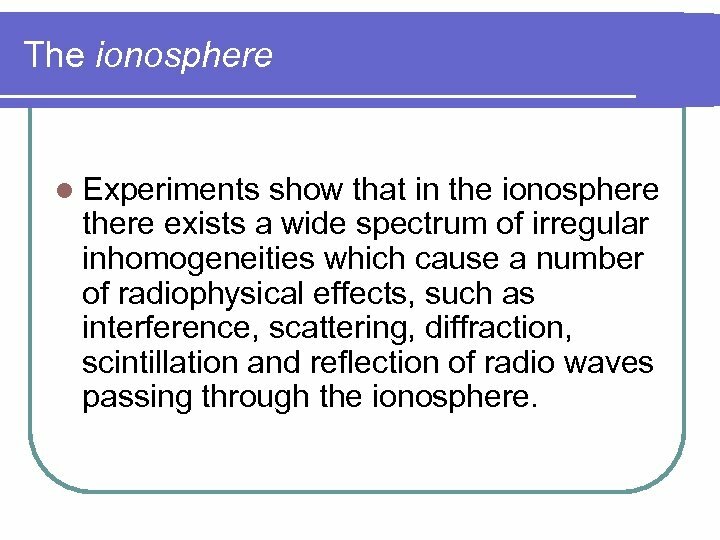 The ionosphere l Experiments show that in the ionosphere there exists a wide spectrum of irregular inhomogeneities which cause a number of radiophysical effects, such as interference, scattering, diffraction, scintillation and reflection of radio waves passing through the ionosphere. 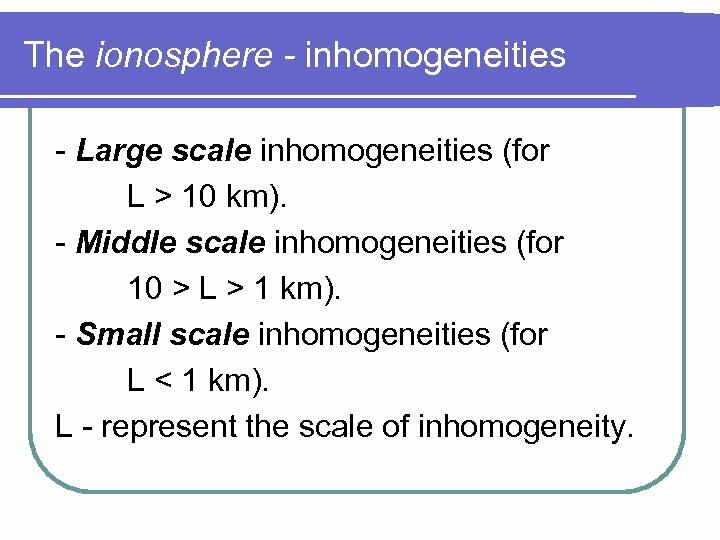 The ionosphere - inhomogeneities - Large scale inhomogeneities (for L > 10 km). 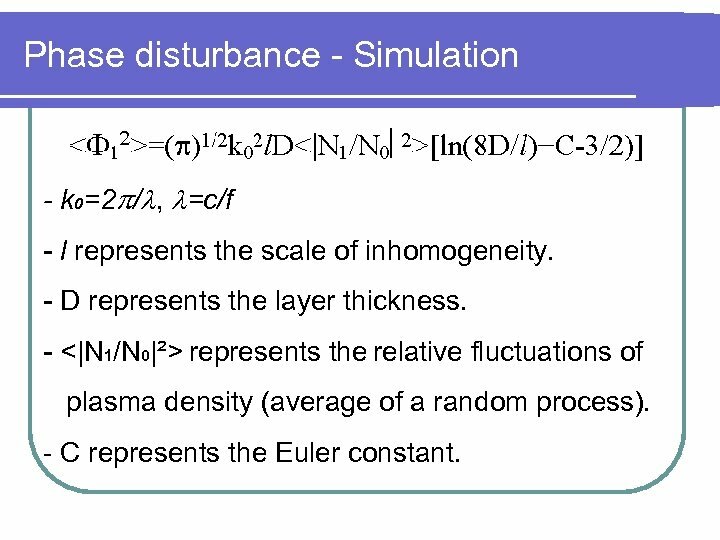 - Middle scale inhomogeneities (for 10 > L > 1 km). 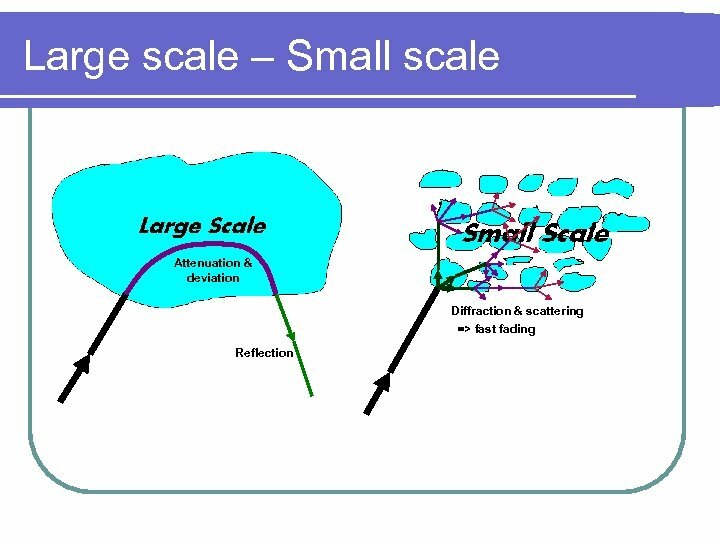 - Small scale inhomogeneities (for L < 1 km). L - represent the scale of inhomogeneity. 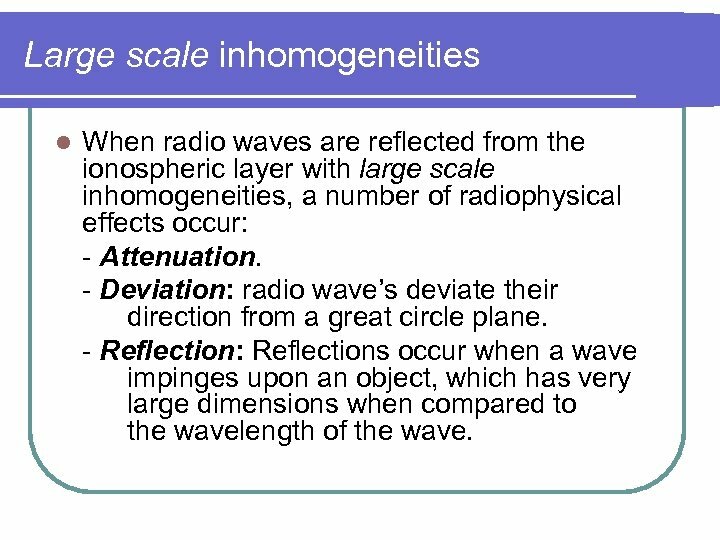 Large scale inhomogeneities l When radio waves are reflected from the ionospheric layer with large scale inhomogeneities, a number of radiophysical effects occur: - Attenuation. - Deviation: radio wave’s deviate their direction from a great circle plane. - Reflection: Reflections occur when a wave impinges upon an object, which has very large dimensions when compared to the wavelength of the wave. 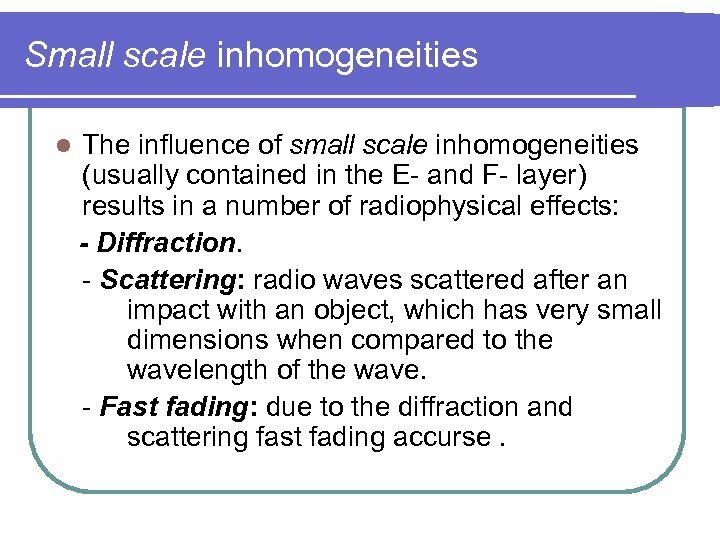 Small scale inhomogeneities l The influence of small scale inhomogeneities (usually contained in the E- and F- layer) results in a number of radiophysical effects: - Diffraction. 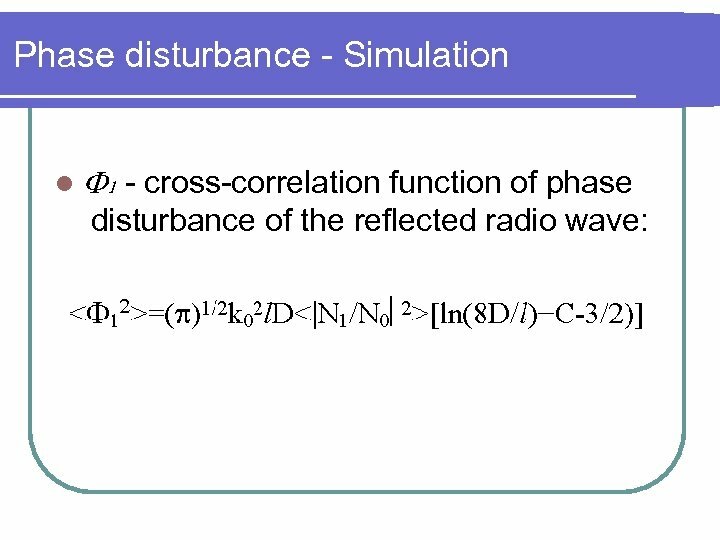 - Scattering: radio waves scattered after an impact with an object, which has very small dimensions when compared to the wavelength of the wave. - Fast fading: due to the diffraction and scattering fast fading accurse. 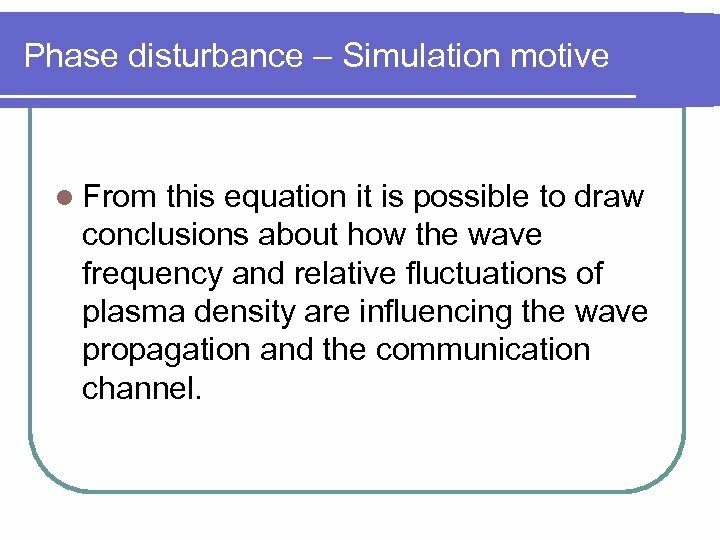 Phase disturbance – Simulation motive l From this equation it is possible to draw conclusions about how the wave frequency and relative fluctuations of plasma density are influencing the wave propagation and the communication channel. 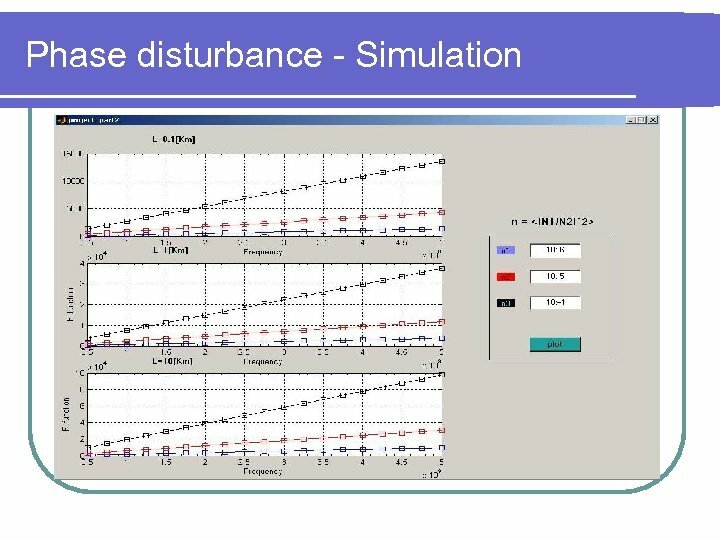 Phase disturbance - Simulation - k 0=2 / , =c/f - l represents the scale of inhomogeneity. - D represents the layer thickness. - <|N 1/N 0|²> represents the relative fluctuations of plasma density (average of a random process). - C represents the Euler constant. 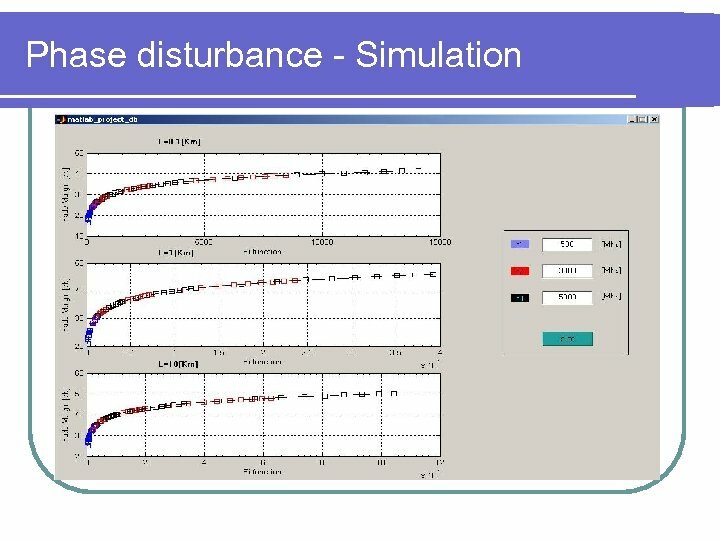 Phase disturbance Simulation conclusions l Higher frequency causes more phase disturbance. 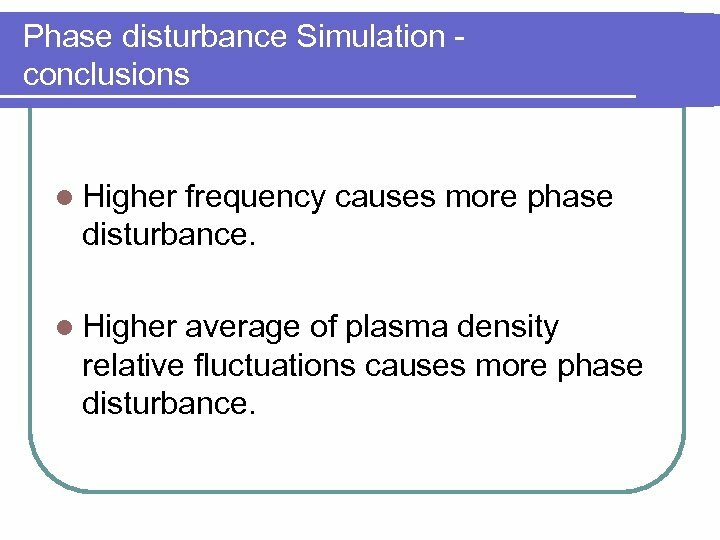 l Higher average of plasma density relative fluctuations causes more phase disturbance. 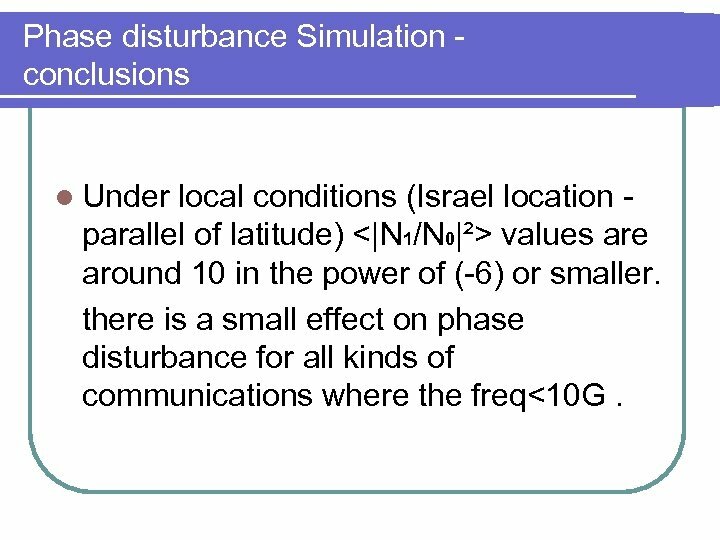 Phase disturbance Simulation conclusions l Under local conditions (Israel location parallel of latitude) <|N 1/N 0|²> values are around 10 in the power of (-6) or smaller. 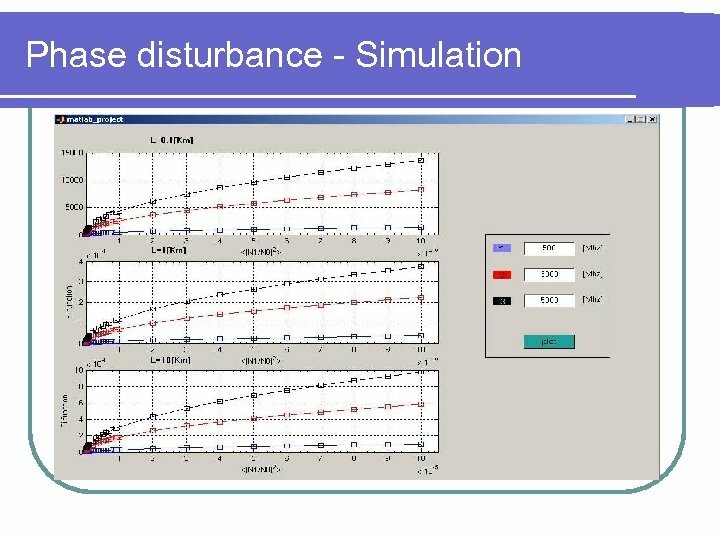 there is a small effect on phase disturbance for all kinds of communications where the freq<10 G.
Phase disturbance Simulation conclusions l In other areas (equator, north pole etc. ) 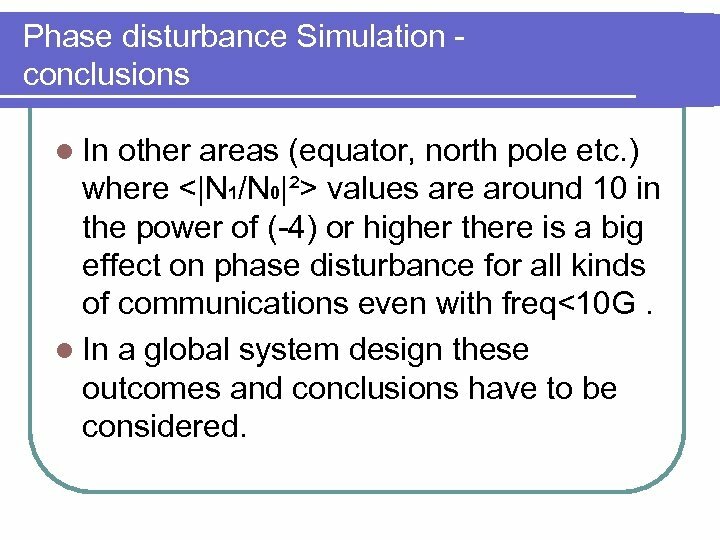 where <|N 1/N 0|²> values are around 10 in the power of (-4) or higher there is a big effect on phase disturbance for all kinds of communications even with freq<10 G. l In a global system design these outcomes and conclusions have to be considered.